The following T-Ring reflection is paraphrased from an article written by Trent Freeman for the Cactus. Trent’s entire article is below. 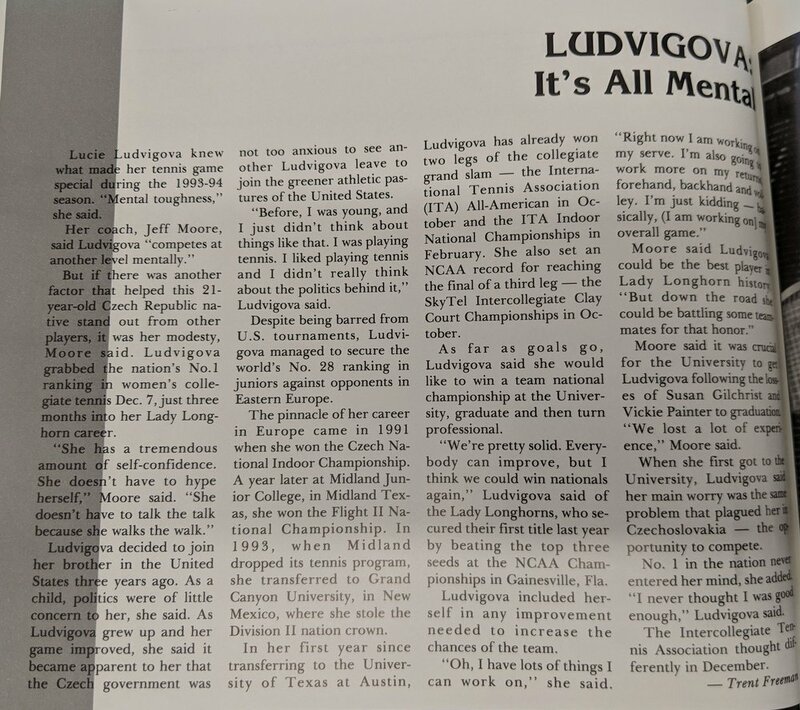 Lucie Ludvigova mental toughness helped her reach the Longhorns by a circuitous route. In her early years she was barred from playing in U.S. tournaments by the Czech government, but she still managed to receive a world ranking as 28th in the juniors bracket. In 1991 she won the Czech National Indoor Championship. A year later she was playing at Midland Junior College and won the flight II national championship. She then transferred to Grand Canyon University in New Mexico where she won the division II national championship. Her success peaked the interest of the UT Tennis coach Jeff Moore and a year later she joined the Longhorn team. Moore said Lucie “competes at another level mentally.” Just three months after joining the Longhorns Lucie Ludvigova grabbed the nation’s #1 ranking in women’s collegiate tennis. Coach Moore said “ Lucie could be the best player in Lady Longhorn tennis history.” Her goal was to help the Horns win the national championship. She was successful in 1995. In addition she was a ITA singles All American 1994 and 1995, Conference Player of the year in 1993, and All Conference in singles and doubles in 1993 and singles in 1994. Below is her acceptance speech as a 2016 HOH inductee.